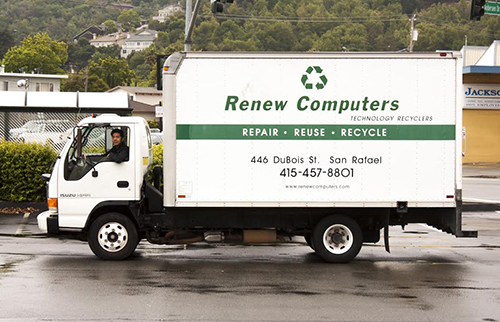 Please call our office at 415-457-8801 Mon-Fri 10am-4pm or email your request to Renew Computers at info@renewcomputers.com. We can most likely schedule your pick-up within two to three business days. We do not do pick-ups on weekends. Please note our list of items we accept and do not accept. Additional fees may be added for very large loads or where two personnel are needed. For companies with very large loads please call for a quote/pricing; a 'very large load' is three or more pallet's of ewaste. We do not charge local schools for pick-ups or recycling. We accept cash, company checks and all credit cards except American Express. Sorry, no personal checks accepted.